ParkCycle Swarm attaches micro-parks to bikes, letting you take your green space wherever you go. ParkCycle Swarm was showcased last year at an Azerbaijani public arts festival. Image courtesy of Rebar. Sometimes you just need some grass where there is none. If you’ve ever surveyed the great concrete plains of the city and wondered how you could add a little more green space, ParkCycle Swarm is for you. Created by Rebar Art and Design Studio and N55 art collective, the ParkCycle Swarm is a system for mobilizing green space—or, more precisely, it’s a swath of living grass on a platform attached to a cargo bicycle. Here’s the scenario: you are heading out for a leisurely day in an herbless urban setting. You hop on your ParkCycle and pedal the 2.25-by-1.2-metre patch of green to your desired location. Then you just fold the bike seat and handlebars under a panel of turf, and settle in for luncheon on the grass, or what-have-you. Suggested customizations for a ParkCycle include pavilions, trees, sound systems, solar panels, and portable grills—all the accoutrements of real recreational green space, only with wheels. Rebar first conceived of the ParkCycle in 2007 as part of PARK(ing) Day, the initiative that kicked off the parking space-as-parklet trend. Last year, Rebar and N55 redeveloped the mobile park into ParkCycle Swarm, promoting the idea of combining several ParkCycles to create consolidated park space, and releasing open-source plans for the units in hopes that aspiring public space–creators would build their own. 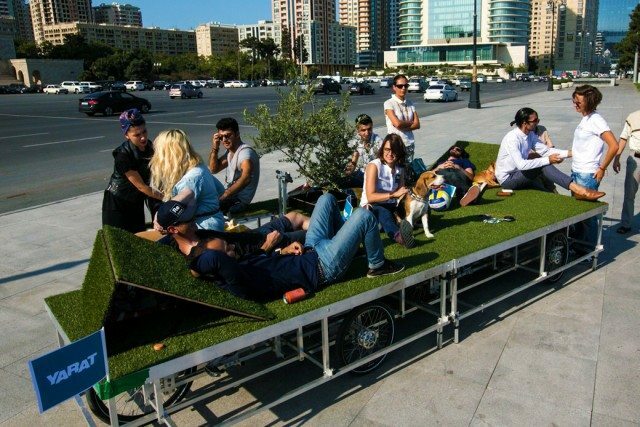 “Multiple users could come together to create their own mini parks working together, aggregating together to form a larger open space,” Rebar’s John Bela told the American Society of Landscape Architects. Might we see a ParkCycle Swarm on the streets of Toronto? We do like strapping wheels onto our public flora. And, while the Swarm conceit was created primarily as an installation at a “public arts” festival in Azerbaijan, a trial run on the streets of Copenhagen showed that ParkCycle Swarm is functional in everyday urban use, too. Each individual ParkCycle conforms to legal bicycle standards (European ones, anyway—the plans make it very clear that you may have to alter your ParkCycle for road use in other places), they fit neatly into existing parking spaces, and they appear to be at least somewhat nimble to drive. That’s a tantalizing proposition for anyone who cares about the space around them.